Crystal Palace won for the first time in 14 Premier League attempts without star man Wilfried Zaha against Leicester City, and manager Roy Hodgson was relieved to end the curse. 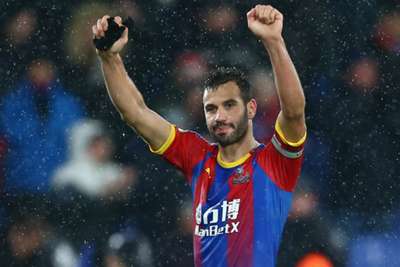 With Zaha suspended on Saturday, Palace earned a battling 1-0 home win courtesy of Luka Milivojevic's excellent long-range strike in the first half. Jamie Vardy had a goal ruled out in the first half for a foul on Palace's Premier League debutant Vicente Guaita, who later denied the former England striker by tipping his strike onto the post as Palace earned only their second victory in 12 top-flight games. Much has been made of Palace's reliance on Zaha, but while Hodgson was pleased to see the run brought to an end, it was not one he had lost too much sleep over. "It is nice to put that one to bed," he said at his post-match media conference. "It is a fact, of course. We have done more than enough to win games when he has not played, but when that good performance was a defeat, the stark fact remains. "But it has got people talking and writing more than it has got us thinking. We have known it was there, but it will be a different press conference next week." Of Milivojevic's winner, which gave Palace a five-point cushion over the bottom three, Hodgson said: "It was a good attack. I was convinced we would get people flooding in on the six-yard box, but it was a goal worthy of winning any game. "[The game] was never going to be pretty, because it was not likely to be open, but it was a spectacular goal to win it. "It is a result we have to be more than satisfied with. When your backs are against the wall and you get the result, you have to be satisfied. "We didn't know about losing the goalkeeper [Wayne Hennessey] until [Friday]. I thought Guaita did very well with very little preparation. We had to dig in to get the clean sheet, and all credit to the back four." Leicester boss Claude Puel, meanwhile, rued a poor start to the game, with his side now dropping out of the top 10 due to a run of only one win in six Premier League outings. "We needed to fight against this team, and battle, but we didn't get the right response in the first half," he said. "I regret our first 30 minutes without the right intensity and play. "It was a tough game, and it was important to make a good start with the right intensity and good pressing, but we had a lot of difficulty to find our play between the lines and we didn't manage to keep the ball in the opponent's half. "The second half was better and I think we deserved to get back in the game. We were unlucky with Jamie's shot that came back off the post. "I think a draw would have been a fair result, and we were unlucky. But I regret the first stages of the first half, it was poor with a poor intensity."